White Helmets operatives training “recruits”, rehearsal stage fires and fake lifesaving …and how to pose in photographs and videos later distributed by pro-NATO press agencies as if were ‘real rescue’ imagery or footage. Google News indexed yesterday (July 28, 2018) a news report about the White Helmets rescued by Israel, and published in YnetNews. This publication is, according to Wikipedia, the “English-language Israeli news website of Yedioth Ahronoth, Israel’s most-read newspaper, and the Hebrew news portal, Ynet. So I understand it’s a main source used by Western mainstream media, and of course by OPCW, under the category they call “open sources”. As I have already commented in a report that made its way to the UN Security Council, these “open sources” have formed the backbone of the allegations of chemical attacks in Syria imputed to the government forces. 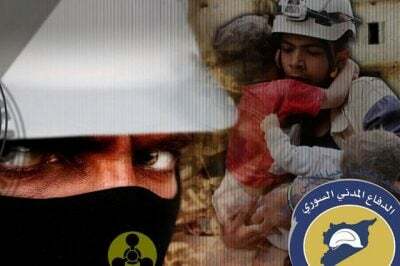 Nevertheless, the Ynet article, titled “As some ‘White Helmets’ escaped Syria, most were left behind” contains an extensive pictorial showing the rescue work of the ‘White Helmets’, referred as to “a civilian rescue organization that works under bombardment to pull people from the rubble.” Of the nine photos in the pictorial, seven are credited to “AFP” press agency, one to “AP” (Associated Press), and one to Reuters. Of course, any one with the idea of amplifying the picture above, could discover that the “patient” is another White Helmets operative. He sports the same uniform-trousers, and the tiny “White Helmets” symbol has not been Photoshop-erased from the right pocket. We also see in the article a dramatic image of White Helmets rescuers extinguishing with bravery, a close distance, the fire exploding in a passenger bus – a rescue operation that, in the context given by the report, has been conducted “under bombardment” – meaning attacks presumably perpetrated by Syrian government forces or its allies. Most of the scenes depicted in the AFP photographic material showed in the commented article do not correspond to actual, true, rescue operations. Instead, those are scenes from a rehearsal conducted by the White Helmet in Marea, near Aleppo. It’s about a training and rehearsal for instance how to set ablaze passenger buses and then posing while extinguishing the fire caused by “the attack” of government forces. In no place in the the article YnetNews article is explained the true origin of the scenes depicted in the photographs, all of them bearing the sign of reputed pres agencies, such as AFP. A reflection at first sight is to realize that White Helmets are not any longer referred as “new volunteers”, but as “new recruits”. And it correctly given, because the White Helmets operatives receive a monthly salary –indexed as “month stipend” by Google. So, the material distributed in those regards by the Western MSM –as in the article commented above– do not correspond to real scenes of rescuing by the White Helmets. Article edited by Dr. Lena Oske, MD, from The Indicter Editorial Board. All images in this article are from The Indicter.